Pioneers in the industry, we offer 4 platform fun play system from India. We are engaged in design & Manufacture 4 Platform Fun Play System, Aqua Fabulous, the Multi-Activity Fun Play Systems. 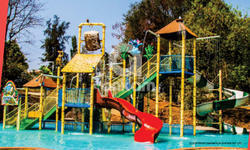 We are specialized in Theme Based water play systems with custom themes as per requirement of the client. Aqua Fabulous i.e. Multi-activity Play Systems are more popular among Small and Medium water park operators due to its good ROI, As it provides entertainment across all ages and genders. Multi Activity Play Systems are Boarded with Multiple slides from Various Heights, Up to 100 water Activities, Huge Tilting Bucket and nozzle and interactive games. Equipped with up to 20 interactive features. Tipping Bucket Dumping gallons of water creates the thundering effect. Can be custom Themed as per requirement. First time introducing the Chinese theme. Taking users to the era of old china. Fabula systems are equipped with nozzle effects and water features. First time introducing lighting systems in play systems, i.e. can be used in nights. Looking for 4 Platform Fun Play System ?